Three members of the Detroit Chapter were present at the National Conference to accept the award. EWB-Detroit is proud to announce that we have been named as the 2014 Premier Chapter for Great Lakes Region professional chapters. 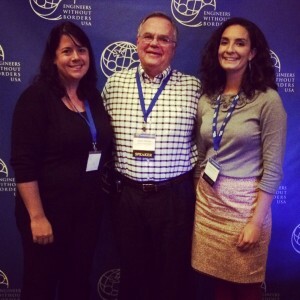 The announcement was made November 1st at the EWB-USA National Conference in Reston, Virginia. The Detroit chapter was selected because of the significant accomplishments we’ve made in the past year including the adoption of the El Balsamar sanitation project, continued progress on our drinking water project in Laguna de Apoyo and our efforts in local outreach and student mentorship. 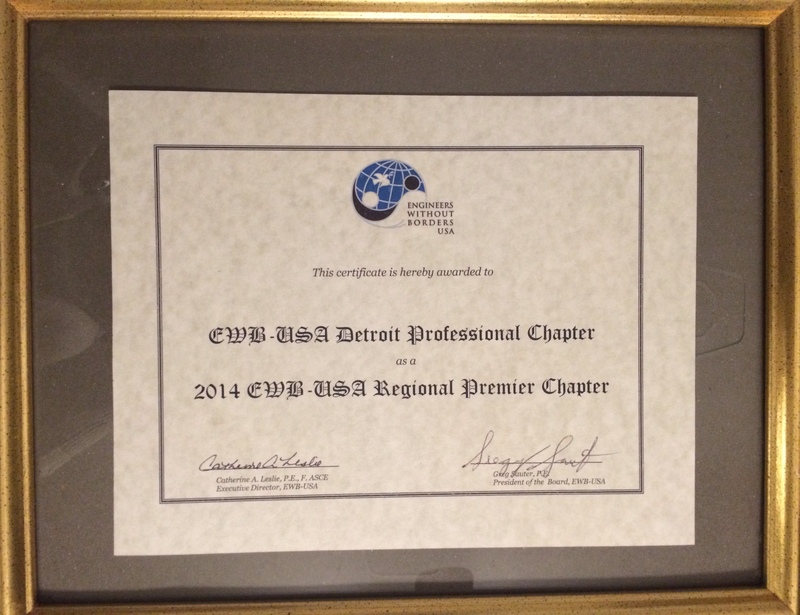 As a Regional Premier Chapter, EWB-Detroit also receives a nomination to be named the National Premier Chapter in 2015. Regional premier chapters are named annually and recognize one student chapter and one professional chapter from each of EWB-USA’s seven regions. There are 11 professional chapters in the Great Lakes region, which spans Michigan, Wisconsin, Illinois, Indiana, Kentucky, Ohio and West Virginia. 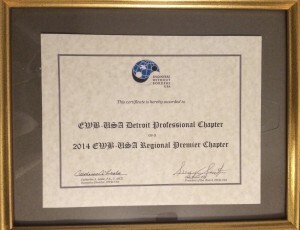 This is the first time the Detroit chapter has received this honor since the chapter was established in 2007.